How Do Online Music Lessons Work? I took 3 weeks off from my normal private teaching regimen to move from Minneapolis, Minnesota, to San Diego, California. While I miss the land of 10,000 lakes (though Michigan has more 😉 sorry, native Minnesotans), I’ve been grateful for the fact that through TakeLessons, I can offer online music lessons with Skype! The technology has allowed me to continue working with two students from the Minneapolis area as well as take on new students in Illinois, Virginia, and North Carolina. So far, I’ve been pleasantly surprised by how easy it’s been for me to transition from teaching in-person to via Skype. I’ve been lucky that most of my students have great internet connections, so it’s easy for me to see their hand and arm positioning (very key) as we’re playing together. We often can play together at the same time, and I’ve even been successful at accompanying my student with guitar chords while he plays an intricate guitar solo (“Christmas Canon Rock” by Trans-Siberian Orchestra, if you’re curious). When introducing a new piece of music to a student, I’ve found Skype’s screensharing feature (here’s tips for Skype in Windows and in Mac) to be invaluable. While my students print out their own copies of their music after I’ve emailed it to them, screensharing allows me to ensure that I can guide their first look at the music. I can turn on the screenshare, then open up the music in full-screen. The student can see my mouse pointer so I can use that to bring their attention to specific aspects of the music easily. 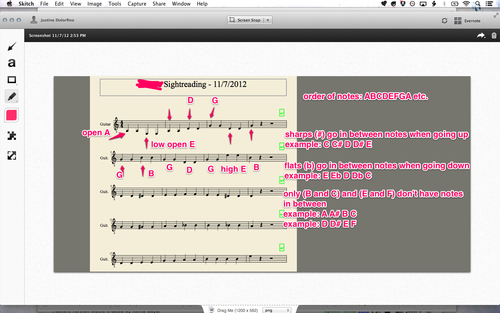 And, if I use Skitch, I can easily annotate what we’re seeing with text, shapes, and arrows. For example, here’s a screenshot of some sightreading I put together for a student who’s beginning to read music notation after a few years of solely working from guitar tabulature. I took a screenshot using Skitch, then annotated it during the lesson. My student was able to follow along and by the end of the period, we played through a few lines together. The cool thing about Skitch, too, is that it integrates with Evernote – a tool I already use to organize my files, lesson plans, and reflections by student. While being able to effectively communicate in a succinct manner, without too much ramblings or insertions of the word ‘like,’ has always been something I’ve worked on since I started teaching, I’ve learned that it’s even more essential while teaching via Skype. Now that I’m no longer able to rely on reaching out to adjust a student’s hand on the instrument, I find myself almost thinking through the instructions I want to convey twice before speaking to my student. I’ve written here before on how I’ve used Paper.app for iPad as, well, a replacement for paper in the private studio. However, now that my student and I aren’t physically in the same space, both of us directing our attention to the iPad, I’ve needed to find a resource to use to accomplish the same thing. 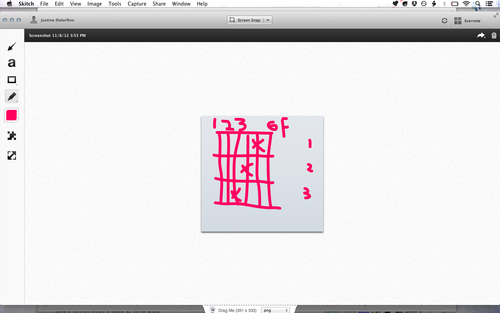 I tried using Skitch today, spontaneously, to draw a chord diagram for a student. Unfortunately, I’m still new to this product, so I didn’t realize until literally as I write this blog post that you can open a blank document with Skitch to annotate; I thought you could only work with screen captures, so I took a screenshot of a blank area on my computer screen and annotated that instead. I’m going to try using a blank Skitch document next time, though I’m also on the hunt for any recommended whiteboard apps for Skype (IDroo looks like a good possibility). However, right after I finish up this blog post, I’m going to go make some hand-drawn chord diagrams for a student, scan them, and then email them; it’s just easier in this circumstance. While I love being as paperless as possible, sometimes it still has its uses…! Do you teach online music lessons via Skype, Google Hangouts, or another software? Let me know what you think! I’d love to hear your tips and experiences! I was really hesitant at how lessons on Skype would go but they rock! I am able to see her show me things and able to hear her play her bass guitar. We are now sometimes even able to play duets together and I think that is a really neat experience.